he historic flood of merger and acquisition agreements that swept through the semiconductor industry in 2015 and 2016 slowed significantly in 2017, but the total value of M&A deals reached in the year was still more than twice the annual average in the first half of this decade, according to IC Insights’ new 2018 McClean Report, which becomes available this month. Subscribers to The McClean Report can attend one of the upcoming half-day seminars (January 23 in Scottsdale, AZ; January 25 in Sunnyvale, CA; and January 30 in Boston, MA) that discuss the highlights of the report free of charge. In 2017, about two dozen acquisition agreements were reached for semiconductor companies, business units, product lines, and related assets with a combined value of $27.7 billion compared to the record-high $107.3 billion set in 2015 and the $99.8 billion total in 2016 (Figure 1). 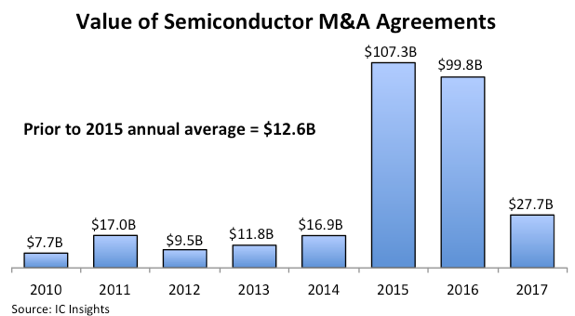 Prior to the explosion of semiconductor acquisitions that erupted several years ago, M&A agreements in the chip industry had a total annual average value of about $12.6 billion between 2010 and 2015. Two large acquisition agreements accounted for 87% of the M&A total in 2017, and without them, the year would have been subpar in terms of the typical annual value of announced transactions. The falloff in the value of semiconductor acquisition agreements in 2017 suggests that the feverish pace of M&A deals is finally cooling off. M&A mania erupted in 2015 when semiconductor acquisitions accelerated because a growing number of companies began buying other chip businesses to offset slow growth rates in major end-use applications (such as smartphones, PCs, and tablets) and to expand their reach into huge new market opportunities, like the Internet of Things (IoT), wearable systems, and highly “intelligent” embedded electronics, including the growing amount of automated driver-assist capabilities in new cars and fully autonomous vehicles in the not-so-distant future. With the number of acquisition targets shrinking and the task of merging operations together growing, industry consolidation through M&A transactions decelerated in 2017. Regulatory reviews of planned mergers by government agencies in Europe, the U.S., and China have also slowed the pace of large semiconductor acquisitions. One of the big differences between semiconductor M&A in 2017 and the two prior years was that far fewer megadeals were announced. In 2017, only two acquisition agreements exceeded $1 billion in value (the $18 billion deal for Toshiba’s memory business and Marvell’s planned $6 billion purchase of Cavium). Ten semiconductor acquisition agreements in 2015 exceeded $1 billion and seven in 2016 were valued over $1 billion. The two large acquisition agreements in 2017 pushed the average value of semiconductor M&A pacts to $1.3 billion. Without those megadeals, the average would have been just $185 million last year. The average value of 22 semiconductor acquisition agreements struck in 2015 was $4.9 billion. In 2016, the average for 29 M&A agreements was $3.4 billion, based on data compiled by IC Insights.